Mention the word “reach” and likely something to do with being able to touch or grasp something comes to mind. We’re on the right track with this thought, but let’s explore it a little more. Reach or reaching for something can be both personal and business, and both are important to growing our aging in place services. On the business side, reach means how far into the marketplace we extend – essentially how far we can stick our arms into the marketplace and connect with people who might need or want to know about our services. So how do we go about making this connection? Several ways. To expand our market reach – the way we connect with people who potentially can use what we offer – we can use print advertising, online resources, or brochures. We can get in front of people who might like to hear about what we offer – radio talk shows, articles we write, presentations at home shows or fairs, or similar opportunities. We can network with professionals who will need someone like us to work with their clients – rehab specialists, discharge planners, case managers, nurses, and therapists. We can make connections with trade partners who can joint venture with us to produce a solution for our clients (whether they found the job or we did) and expand our capabilities and market appeal this way. There are so many ways we can make inroads in the marketplace and increase our influence – what we call reach. The more our name is known among those who need the services we provide – whatever those might be – the more that people use us to help them, and the stronger our reputation is, the more reach or market influence we are going to have. This, in turn, will mean more satisfied clients. There is nothing wrong with attempting to extend our reach into the market. It’s how we grow as a business and serve more people. Without people knowing who we are and what we can do to assist them they won’t contact us, and we won’t gain the business. They will either go without a solution or choose someone else to help them. Expanding or extending our reach into the marketplace is how we are going to create a stronger brand, name identity, and connections with potential clients. Before we move on to consider the importance of reach as it relates to our clients and how they use their living space, we have to have sufficient market reach to allow people to know that we are available to help them. This is why we are in business, and we want to serve our clientele. Thus, our market reach needs to be strong – however we choose to do it and regardless of whether we pay a lot or a little for it, or even if some of it is free. As for our clients, so many of the facets of their homes restrict their reach in some form. Thus, a design solution that focuses on increasing a person’s reach is going to enable them to enjoy their living space more and to be safer in it. Unlike the marketing that we do to increase our market reach, we can’t actually increase someone’s physical reach. In fact, it’s likely to decline over time as their range of motion, height, and joint flexibility lessen. What we need to do is take their reach into account as we are designing and make sure that what their hands can contact effectively anything they need to touch, use, hold, grasp, retrieve, or control. This means that stationary cabinets – ones that aren’t motorized or those that don’t have interiors that rotate out into the room for easier access – are not going to work for many people. True, aging in place designs are based on the needs and abilities of our clients, but in general, this is something that we need to accommodate in our designs. 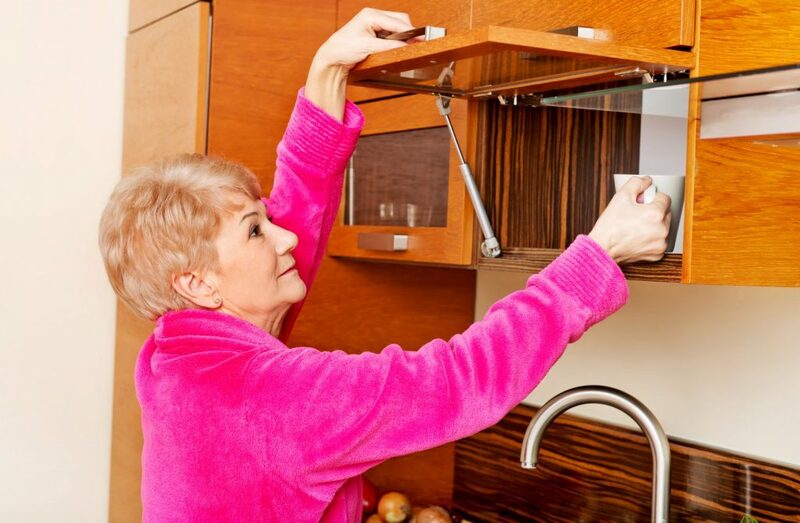 Anything that requires a person to reach out their arms with a full extension or to have part of their feet come off the ground rather than remain flat-footed – or to require the use of a small ladder to step stool – is going to be uncomfortable and potentially unsafe. It also means that they may not be able to control what they are attempting to touch and use. Whether it’s in the kitchen, bathroom, bedroom, laundry room, their closet, pantry, or any other space in the home, we can’t allow our clients to be limited in what they can use because it is beyond their physical reach. The more we focus on this critical aspect of design and become proficient at it, the better we will get at creating effective solutions that we can introduce to each client as they need them.